I don't know about you, but I love a good sandwich. I could never give up bread, I tried to go no-carb in college and it was the grumpiest month I've ever had! I've since switched over to a healthier "everything in moderation" perspective of food, rather than dieting. I blame my love of sandwiches fully on my failure at the no-carb trend! Sometimes you just need a great sandwich for dinner. 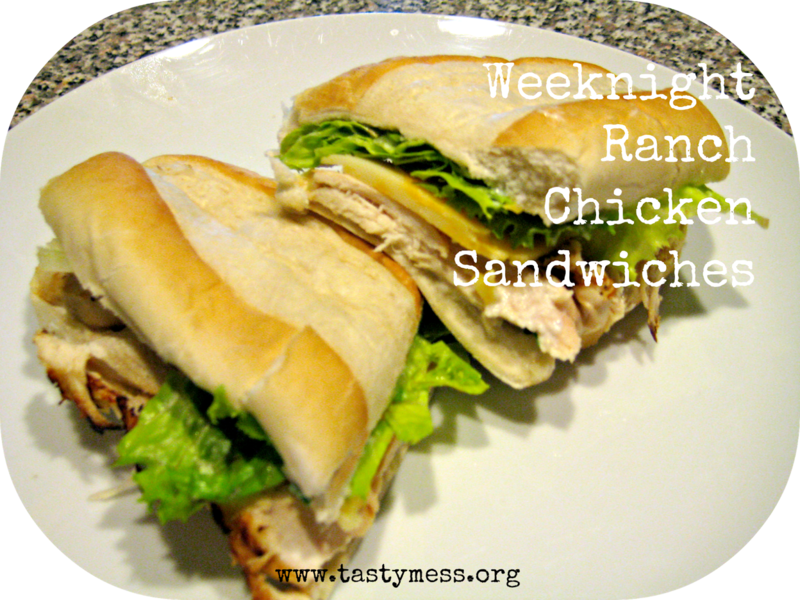 I love a casual dinner every once in awhile and sandwiches are a huge hit in our house. I'm not talking a slapped-together PB&J or grilled cheese (although some nights I'm guilty of those), but a more planned and complete sandwich really can feel like a meal. I've been toying with making my own salad dressings for awhile, but had never really tried a ranch-style dressing from scratch. This one is fantastic as a sandwich spread and if you want to use it as a dressing, just increase the liquid a little bit and decrease the thickeners like the sour cream or mayo. Don't skimp on the fresh chives though, they make the whole dish! You can serve these up on any type of sandwich roll, but my go-to bread for a sandwich like this are hoagie rolls. If you feel like making your own from scratch, you can't do better than the Light Brioche Buns (original recipe from Smitten Kitchen) that are my absolute favorites! Combine half of the buttermilk, hot sauce and a sprinkle of salt and pepper in a large bowl. Add in the chicken, making sure each piece is covered and coated with the mixture. Set aside to marinade for about 15 minutes. Preheat a grill pan (if you have one - I used a cast iron skillet) to medium high heat. If using a grill pan, spray lightly with nonstick spray. If using a cast iron or other type of skillet, pour about 1 tbsp. oil in the skillet and heat until shimmering. Transfer the chicken to the pan in batches, cooking about 3-4 minutes on each side, until done. Cover each cooked piece of chicken with cheese and set aside so the cheese has time to melt. Whisk together the rest of the buttermilk, mayo, sour cream, a generous sprinkle of salt & pepper, garlic powder and apple cider vinegar. Stir in the chives and taste to adjust seasonings and texture. Spread each roll with some of the ranch sauce and fill with the chicken, lettuce and tomato. I like to serve these up with sweet potato fries and a big garden salad - yum!